The Hercules Remote Printer Spooler for Windows is designed to receive text output from a Hercules line printer, and create a PDF, RTF, HTML or text file on your Windows system. Because it uses standard TCP/IP sockets to communicate with the Hercules line printer, the system whose line printer HercPrt is spooling for can be located anywhere on the planet reachable via standard IP networking. You may download and try HercPrt for free with no obligation whatsoever, but it is not freeware. Once you have downloaded it and found it to be useful you are expected to then purchase your copy if you wish to continue using it. It is designed to receive text output from a Hercules line printer, and create a PDF, RTF, HTML or text file on your Windows system. 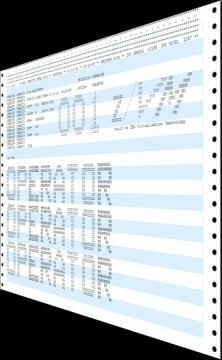 HercPrt directly uses the information from the operating system's print job separator pages to provide a unique name for each print file it creates and is fully customizable. Several job separator control files for some of the most popular mainframe operating systems are provided with the product. The job separator control file tells HercPrt what your Hercules guest operating system's job separator pages look like, so that it can automatically create separate Windows files for each print job, each optionally named according to your choice of job accounting field values extracted directly from the job separator page itself. HercPrt will create these spooled print files in whatever directory you choose using the options you specify. Several HercPrt instances can be run simultaneously, each spooling a different Hercules line printer for either the same instance or a completely different instance of Hercules. The options used for each are saved under a user specified Printer ID so that the same options can be quickly and easily specified the next time HercPrt is run by simply selecting the desired Printer ID from the provided list of previously defined Printer IDs. The main dialog user interface is fully resizable and can be completely hidden (minimized) to the system tray area for minimal interference with normal Windows use. Automatic connection and reconnection support (with a user configurable delay between retries) is provided as well as complete control over the display of user friendly popup balloon tooltips used to notify you of either an incoming printout or unexpected loss of connectivity. New .INI Job Separator Control File names: DOSVSR34->DOSVS, zVM53->zVM, etc. Add numeric YYYY, MM and DD jobsep date fields and use in OutputFile name. New OutputFile "Drop" option to drop beginning/ending separator pages.